Thanks to its clean interface, MetaFox can convert different video formats to the currently popular MKV format while providing some customization options such as alternative methods, Dsmux, Compress Head, Mux All Imput and even splitting DVD episodes. 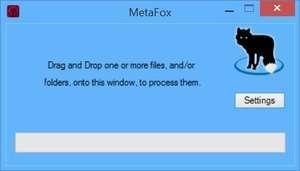 You can either load files directly in to MetaFox or drag-and-drop them directly from a Windows Explorer window. In addition to this, MetaFox also supports batch processing which means multiple files and be converted in one go. Version 1.7.6 is a freeware program which does not have restrictions and it's free so it doesn't cost anything. For security reasons, you should also check out the MetaFox download at LO4D.com which includes virus and malware tests. Additional screenshots of this application download may be available, too.